Taking his fiddle on a rare foray outside his baroque comfort zone, Fabio Biondi here explores his compatriot Paganini’s delightful and under-appreciated oeuvre for violin and guitar. He is joined by early guitar specialist (and regular Europa Galante collaborator) Giangiacoma Pinardi in what is a svelte, luxury production from Glossa of music that is characterised by elegance and good taste as opposed to jaw-dropping virtuosity. Paganini was a master of both instruments – the fluency of all the music on this release bears ample testimony to that fact. The earliest work here is the rather Mozartian Sonata concertata of 1804, and it is unique in this recital in having a three-movement structure. It begins with an extended Allegro spiritoso which is laid out in quasi ‘call and response’ terms. The guitar actually seems to lead from the outset, but its theme is soon taken up by the violin and as the movement proceeds in its civilised way it is evident that the roles of both instruments are fluid and democratic. The playing of both partners is affectionate, understated and warm. The movement is typical of an album which enhances even the loveliest summer’s day. Two much briefer movements follow: a winsome Adagio with busy guitar and a lively Rondeau whose deceptively tricky violin part is dashed off effortlessly by Biondi. Early Paganini also concludes the disc in the form of the mock-tragic Sonata Op 3 No 4. Don’t be fooled by the minor key – the sad opening is gently mocking – the tiny finale is marked Allegro mottegiando which is translated as ‘jeeringly’ but I think can be understood as ‘ironically’. Either way, this four-minute work at least hints at virtuosity – and both instruments are made to cry, sigh, speak and chuckle. The rest of the album is given over to a selection of Paganini’s 18 Centone di sonate which date from the other end of Paganini’s compositional career. The word ‘centone’ implies a medley, and it’s fair to say that these sunny, major-key works are unerringly breezy and light. Individual examples might incorporate the songs of birds (No 7) or children (No 12); they are all by turn playful, sophisticated and above all graceful. 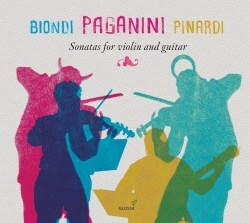 Biondi and Pinardi imbue each movement with a tangible sense of the joy of collaboration, and heartfelt affection for the music. In no sense is this disc designed to trigger deep, philosophical musing; indeed, one would need a heart of stone not to respond with the readiest of smiles to its ample charms. The recording is warm and immediate – it positively glows with Mediterranean sunshine – it was made in Spain by Italians, after all. One aspect to the presentation that rather mystifies me is its apparent concept. Pierre Élie Mamou has provided a fascinating and thought-provoking essay in the booklet which considers the so-called ‘God/Devil dichotomy’ of Paganini the performer. This is considered in the context of two of the most famous portraits of him, by Ingres (Paganini as god) and by Delacroix (Paganini as devil). Both images are reproduced. The concept is further reinforced by the eye-catching sleeve design. Had the disc included some of the composer’s early Caprices Op 1 or the first violin concerto this paradox would have been made manifest; the fact is that all of the music here is so unequivocally easy-going that it’s truly hard to envisage it emerging from a musician once described by the contemporary critic Ludwig Boerne as “…the most magnificent lout that Nature ever invented”. Having said that I found it a most agreeable sonic accompaniment to a glass of chilled Pinot Grigio. And so, I suspect, will many other listeners.